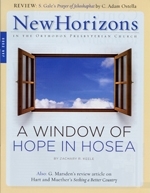 When we think of the prophet Hosea, the first thing that comes to mind is his wife Gomer and their children. The Lord used them as a living metaphor for Israel's relationship to God, and so ours. But this is not all we should think of, for the last verse of Hosea calls us to understand and walk in the ways of the Lord, which lead to life. This gives us a beautifully unified message for our faith. "The interpretation of the Bible begins in the Bible itself," asserts Benjamin D. Sommer in a recent article. Such an idea is not new to readers of this magazine (see WCF, 1.9), but Sommer's point reflects a growing trend in the academic community: to see the biblical authors picking up themes from their predecessors and developing them in what may be called a kind of rereading. Martin Luther said, "[The prophets] have a queer way of talking, like people who, instead of proceeding in an orderly manner, ramble off from one thing to the next, so that you cannot make head or tail of them or see what they are getting at." For many people, the prophet Ezekiel matches Luther's description perfectly.